I’ll be teaching a Zipper Pouch workshop for Vancouver Modern Quilt Guild on Sunday November 26th, and one of the zipper pouches we’ll be making is a vinyl toiletry bag. The workshop uses a number of supplies that most quilters won’t have in their stash, but I do, and I’m happy to share! You are, of course, welcome to source your own supplies, this is just for your convenience. I have glitter vinyl kits available for purchase for $7.50 per kit. 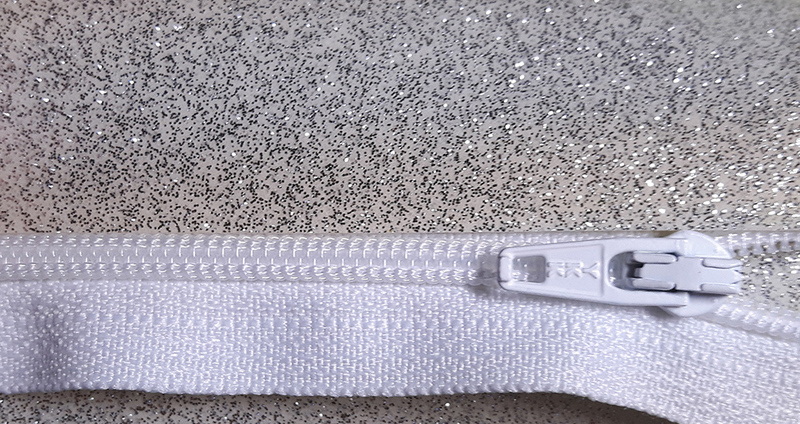 The kit includes a piece of glitter vinyl large enough to cut your pouch out of and a coordinating zipper. Glitter vinyl is very hard to find in Canda, and very expensive when you do. I also have non-glitter vinyl, if you would like a kit that is less sparkly . If you’d like a more subtle toiletry pouch, please email me to chat about colour options and price for regular upholstery vinyl. Vinyl/Leather Needles are not commonly carried by LQS, and Fabricland charges $17.40 for 5 Schmetz needles of a variety of sizes. You only need one needle for your pouch, and you definitely don’t need to spend $17! I ordered some Schmetz 100/16 needles, and can sell you a needle for $1.75 each. I also have a large stash of 7” zippers in a wide variety of colours that I will bring to the workshop and will sell for $1 each, so if you don’t pick up your 7” zippers, you’re welcome to raid mine. Bring change to the workshop if you’re planning on doing this. If you would like to purchase supplies from me, please email me to order them. There are limited amounts of each colour available, and they are first come, first serve (see below, i’ll be keeping the numbers as current as i can). I will bring the kits to the November VMQG meeting so that you have the vinyl to find coordinating thread for your pouch. Glitter Vinyl kits are $7.50 each, colour selection is first come, first serve. Please pre-order. Schmetz vinyl/leather needles are $1.75 each. Please pre-order. Note: Glitter vinyl is incredibly difficult to photograph, as soon as the camera focuses, it picks up on the metallic sparkles and it skews the colour of the photo. The closest images come from photos that are out of focus, and even those are not exact. I have attempted to colour correct some of the images, but they are still not perfect matches. Please keep that in mind when ordering! The following kits are available, please email me to order.